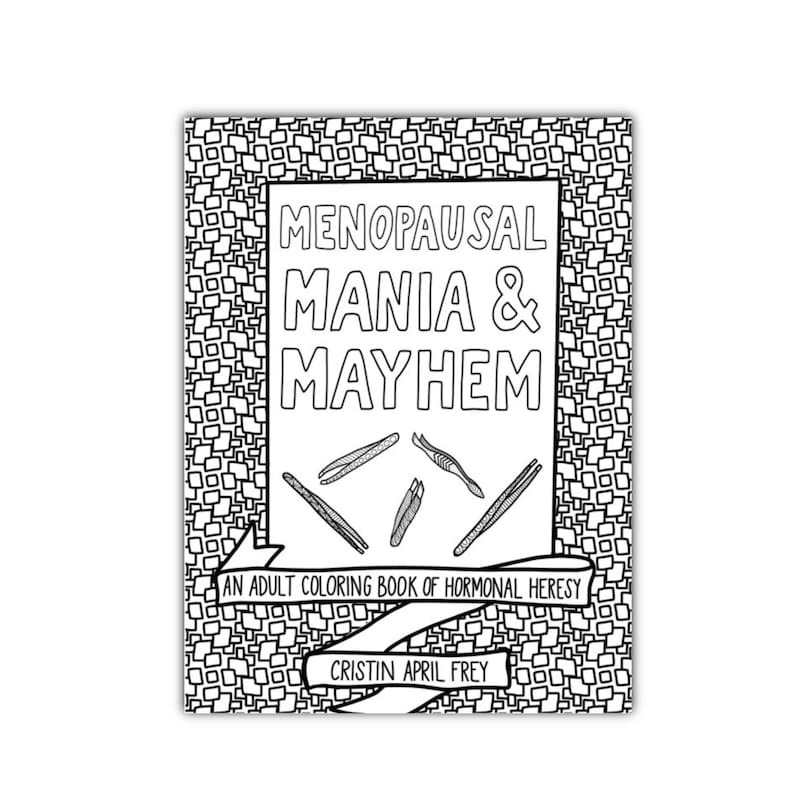 Unlike any other and the first of its kind, Menopausal Mania & Mayhem is a unique collection of 20 hand-drawn coloring pages, plus 10 bonus pages of menopausal mandalas! It is also a perfect gift for the “vintage” women in your life. Menopausal Mania & Mayhem includes a variety of original, completely hand-drawn designs and hilarious, relatable sayings. The designs range from simple and easy to intricate and challenging for all skill levels, or to suit your mood. Adult coloring books are known to reduce stress, calm your thoughts, relieve anxiety, and even help with pain management. It can be used to practice mindfulness and meditation as well as a way to relax. With the funny sayings, it makes stress relief much more fun! If you have a bit of sass in your attitude, you will love this coloring book for grown-ups and you will surely get a giggle or two out of it. For more information on the artist/author, please visit her website at www.CristinApril.com. This purchase will come with 3 PDF files which include all of the pages inside the book. This is an instant download so there's no shipping costs, no waiting, and you can start coloring right away! These coloring pages were hand-drawn by me and turned into printable coloring pages for you to enjoy! •As soon as your payment is confirmed, you will be able to download and print on Etsy or your Etsy registered email. •No physical item will be shipped. • It will print on letter-sized paper (8.5" x 11"). • No watermark will appear over the illustration upon purchase. • You may print and color as many times as you like for your personal use. •Printable coloring pages are not refundable. • Printing onto regular paper is fine if you plan to use crayons or colored pencils. • If you plan to use markers or paints, I suggest printing onto thicker paper such as card stock. Please stop by my social pages share your completed colorings! ©CristinApril 2015. All rights reserved. All coloring pages are for your personal use and enjoyment only. You may print as many times as you like for your own use but please do not distribute in any way. You may not sell or share the image file, sell or share printed copies nor use the image or file for any commercial use without my written consent. THE UNCOLORED IMAGES MAY NOT BE POSTED ONLINE OR IN ANY SOCIAL MEDIA PLATFORMS IN ANY WAY. Digital downloads are non-refundable, based on their nature. However, I want you to be happy with your purchase so if you aren't satisfied with any of my art, please reach out to me and let me know and I'd be happy remedy the problem in any way I can. For custom artwork, no refunds will be given after your proof has been sent to you. All items are hand-made by me, Cristin Frey. I retain full copyright with all rights reserved. Please understand that colors may vary slightly due to differences in monitor and printer configurations. As a buyer it is your responsibility to know how to download digital files and use your own software. My digital downloads are made available through PDF, PNG, JPEG, ZIP, TTF, SVG, or Procreate files so you will need software on your devices to download and view. I would appreciate any reviews you can leave for me.